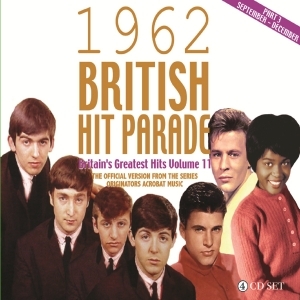 Acrobat Music’s series of British Hit Parade collections has become an essential annual purchase for a significant number of collectors and enthusiasts who wish to hear and own every record that entered the British record charts during each year. As the collections move into the ‘60s, the steady but inexorable shift in the balance of the music styles represented in the charts continues. As with the last two years, with the New Musical Express and Record Retailer charts extended to a Top 50, and including all the records which only charted in Melody Maker, Disc or Record Mirror, the number of titles in the complete anthology is just under 300, meaning that the collection comprises 12 CDs, once again released by Acrobat as three 4-CD box sets, our well-established format for these releases, along with the customary substantial 15,000 word booklet. Once again, we are also producing parallel collections of the B sides of these hits. Part Three includes the original versions of every record that entered the charts mentioned between 6th September (other 6th September entries close Part 2) in chronological order of chart entry, with nearly four hours of eclectic and fascinating entertainment. The charts of 1962 had a rather “safe” feel to the music – whether this is just us knowing in hindsight the revolution that was about to happen or not, it was clear that Tin Pan Alley was well in charge, with dozens of solo artists guided by their recording managers and brilliant backroom songwriters making skilfully crafted but sometimes bland recordings. The bite and challenge that the advent of rock ‘n’ roll had brought had been watered down. That’s not to say the music wasn’t entertaining and interesting, and the commercial environment laid the way open for an eclectic mix of genres to be accommodated in the charts, with modern jazz, country and early soul music finding their niche alongside the always collectable offerings of the forgotten one-hit wonders. One record in this Part, of course, heralds the changing times with the first Beatles hit, and the landscape would change dramatically within just a few short months. We would point out once again that another company has made an opportunist attempt to mimic our series – we like to think that Acrobat’s are the “official” version, and we offer the only complete, comprehensive, coherent annual series. We thank our customers for supporting our British Hit Parade releases, and are sure this will one will prove as popular as the rest. 10 Me And My Shadow Frank Sinatra & Sammy Davis Jr.